Prof. Gurmeet Singh, Vice-Chancellor of Pondicherry University in the presence of our honourableVice Chancellor, Prof. SubhashChandra Parija, Sri Balaji Vidyapeeth, Pondicherry. Prof. Subhash Chandra Parija addressed that, “Distance is a critical factor between a patient and a doctor. Telemedicine means Death of the Distance. By eliminating the distance, it saves time and helps to save lives in emergency situations and gives the rural population access to good health care. Telemedicine makes patient feel the presence of doctor any time (Tele – Presence). Connectivity is the “Life-Line” of any telemedicine activity. Failure of any telemedicine program or activity is not due to lack of infrastructure, but due to lack of interest in adopting the technology. With increase in Information and Communication Technology (ICT) by leaps and bound, telemedicine should be adopted by health care providers at all levels of patient care. Prof. Gurmeet Singh, VC of Pondicherry University. While launching the facility, Prof. Gurmeet Singh congratulated the medical fraternity and emphasizedthat a village is a basic unit of our country, whose development leads to the success of our nation. Telemedicine will be a boon to the villages. Serving with purpose and sincere effort for the nation, will make everything fall in line for us. Prof. V. NirmalCoumare, Medical Superintendent of MGMCRI conveyed that “One of the biggest benefits that accrue from telemedicine provides, is the bridging of distance. Its use can reduce unnecessary travel, expenditure, and even physical strain. A patient can gain access to medical resources without resorting to the constraints. It also solves the problem of retaining specialists in non-urban areas”. Dr. Swati Jayant Pawar, Deputy Medical Superintendent stated that “Telemedicine covers a wide gamut of activities related to health care. The system can enable a doctor to conduct a detailed clinical examination remotely”. 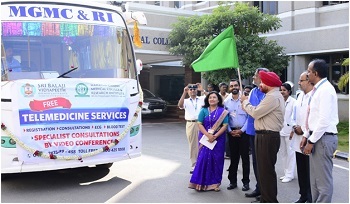 Prof Gurmeet Singh flagged off the telemedicine bus to commence its journey of service. The mobile Telemedicine service is based on Wi-Fi enabled telemedicine locomotive and a webcam. On a pilot study, this mobile service has been reaching remote areas of Pondicherry and the neighbouring Tamil Nadu every Friday, since October 2018 and revisits the same area once every 2 months. 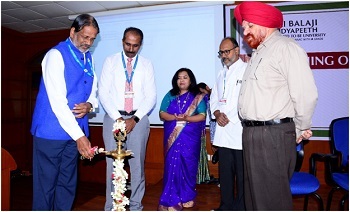 Over the past four months, the telemedicine camps have examined over 5000 patients and enabled 18000 laboratory investigations and over 1000 Tele-consultation with Specialists and Superspecialists available at our Mahatma Gandhi Medical College & Research Institute. We are confident that this service would contribute immensely to the health care of the people living in the underserved areas and also at remote places.